It is proposed that we release Elders Charles Didier, John M. Madsen, Lynn A. Mickelsen, and Dennis B. Neuenschwander as members of the First Quorum of the Seventy and designate them as emeritus General Authorities. It is also proposed that we release Elders Douglas L. Callister, Shirley D. Christensen, James M. Dunn, Daryl H. Garn, Clate W. Mask Jr., Robert C. Oaks, William W. Parmley, W. Douglas Shumway, and Robert S. Wood as members of the Second Quorum of the Seventy. Those who wish to join us in expressing gratitude to these Brethren for their excellent service, please manifest it. 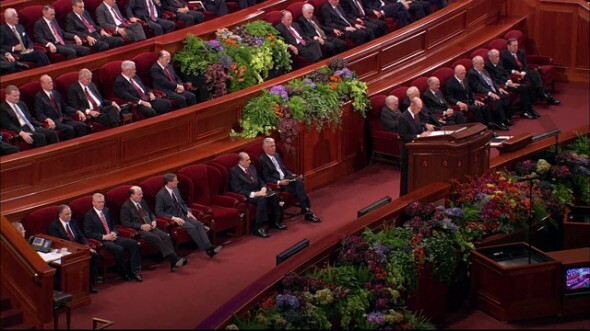 President Monson, insofar as I have been able to observe, the voting in the Conference Center has been unanimous.